We have new challenge for you at SCACD Friends with Heart ~ Challenge #9- In honor of the US holiday, Memorial Day, use stars on your projects. For my card I did use the adorable image "Me and My Buddy" by Elizabeth Bell exclusive for SCACD . I did made a simple layout just because I think the stars and the image says it all! I hope you will come and join us this week at SCACD Friends with Heart! 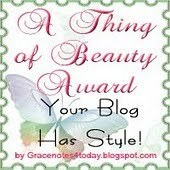 I did get this adorable Award from dear blog friend Marie, she have such a sweet blog. Thanks dear, I am really honored. Today is a special day for a dear friend of mine, whom is turning 50 , yeepppyyyy! The card which I have created is to wish him a special Birthday full with happiness and joy! This is also my last card for The Crazy Challenge blog. Thanks girls! Our challenge this week is Pets. Sponsor is AiFactory, sorry my card is not with image from them. I did use the image from Karen's Doodles ~Tango. The image is coloured with Copics in my favorite colours combo Yellow and Purple ( again ,lol) . Yellow's : YR24,y19,15,13, Purple's: V99,95,93. My card is going to enter the challenge over at Make it Colorful ~ Yellow and Purple. It's time for my DT post at Digi Bells. I did use the digi image "I Love You This Much"by Elizabeth Bell . As you know me, you do know I love deep rich colours, lol. Here it is again in one of my favorite colours combo Yellow, Green and Purple. I did use the new cool Magic Pearl Pen at SCACD store, Susana have a lot of them. Here is my another card just for fun . I love , love this Fairy Finna from Mo's and the background scene Daffodil Dell Digi Stamps from Make it Crafty. At Make it Colourful they have a challenge ~ Colour a water scene. I just love how this scene turn out. It's time for a new challenge over at SCACD Friends with Hearts ~ Anything Goes with stamps from SCACD. For my suprise box I did use de adorable image "Tea for Two " by Victoria Case exclusive for SCACD . Isn't she cute ?! I had such a fun colouring her. I hope you will come and join us this week at our challenge. Blog Hop to showcase the cutie by Elizabeth Bell ~ "Duckie"
This is my second post for the SCACD release pls. roll down. Well it's time for new digi image by Elizabeth Bell and this time we have the cute and adorable "Duckie"to show you. If you came here from my blog friend Mary Lou you are on right place. I did made a Bathroom hanger. I just had such a fun colouring and making this door hanger. Isn't he cute and adorable ?! Look at tell me, LOL ! Well you know it's Blog Hop and we do have some candy's for you. will be picked from the comments. card and post it on the Digi Bell Blog. "Just Fun". Using ANY Elisabeth Bell image. Now is time to hop over at Wendy. THIS LITTLE CUTIE IS GOING TO ENTER THE CHALLENGE AT MAKE IT COLOURFUL~ challenge #18 Dotty Backgounds. It's time for a new challenge at SCACD Friends with Hearts, our challenge for you this week is ~ Blue, Pink and White . For my card I did use de adorable little Peeker "Hey Birdy!" from the exclusive "The Peekers" collection by Elizabeth Bell for SCACD. I coloured her in Blue ( B26,24,21) Pink ( R85,83,81) White ( E42,41,40) Gel pen and Glamor Dust. Hope you will come and join us HERE ! It's Monday and that's meen we do have new challenge for you at the Crazy Challenge blog ~ Green and Pink. Our sponsor this week is Digi Doodle Shop. The image name is Daisy Girl, isn't she precious Day Dreaming, lol. She is coloured in green and pink colours combo with copics. The winner of my Christmas bag is Heidy. If you want to take a peek you can do that HERE. It's time for our new challenge at SCACD Friends with Hearts ~ Paper Piecing.For my card I did use the amazing image "Suzanne"by Victoria Case exclusive for SCACD from Every Day Gals Collection. There is a lot more to choose at her store. I just love to shop there. Hope I will enspire you with my card to come and join us at SCACD Friends with Hearts challenge. If you like you still have time to join my give away "Christmas bag" Here. I am on my way home, all post will be scheduled. Today for my posting at Digi Bells DT I did create a Christmas bag with the adorable digi image Eden's 2nd Christmas by Elizabeth Bell. And of cource Christmas bag must be with some goodies, lol. I put some stamps inside for one of you ladies. Don't forgot that the "Mother gift challenge" is still on at Elizabeth Bell's World Challenge blog. I will pick a winner next Sunday! We do have a new challenge for you at SCACD Friends with Hearts ~ Anything Goes with SCACD stamps. The prize this month is very adorable and cute, do you want to know what it is?! Come and visit our challenge blog HERE, I am sure you will love it! Today I have a Retro card to show you. Well, I think is a Retro and I love this image by Vicroria Case exclusive for SCACD. Now about my news . I am very happy and honored to announce that Janiel and Lynda from The Digi Bells, invited me to be on their permanent DT. As you know I was GD for March and April. I love Elizabeth Bell images and this is really something very special to me. Wish you all a wonderful week.